Tour guiding can be stressful. What will await you when you open that front door? Will there be one person gazing up at you, or a horde of thirty or forty? As a grizzled old veteran of a guide, I sometimes smile patiently when newer guides tell me of their woes. For I still carry the scars of tours past. At night I sometimes awake in a cold sweat, terrified by images of monocles, and swearing blind, that I can hear, like a haunting melody, the strains of Noel Coward singing 'Poor Little Rich Girl'. Surely a guide that has had to dress up in spats, bow-tie and blazer, with a boater perched precariously on the side of his head, and was forced (some like to use the word 'employed', I prefer 'forced') to conduct tours of costumes from the BBC series 'The House of Eliot' and of original 1920s dresses, without having the first idea about dresses, deserves to have the respect, nay, affection, of his peers. 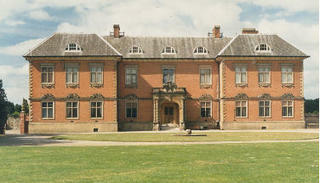 That was the waif-like me in 1998, when the 'Sparkling Twenties' came to Tredegar House. The tours were quite popular. Personally I became convinced that most attended the House simply to laugh at me in spats, but, I suppose, a few were interested in the remarkable dresses on display. A year later, the costumes from the BBC series 'The Aristocrats' were put on display at the House. I was greatly relieved that the guides did not have to dress in costume for these tours. I think that kitted out in whale-bone stays and corsets (that as far as I could make out, were designed to torture the wearer), guides would have lost consciousness by the end of the day. We were very unlucky with these tours. Due to a mix-up, when the costumes were at Tredegar House, the BBC hadn't shown the programme on TV; it had been delayed. So, aside from the fans of Stella Tillyard's book, most people had never heard of 'The Aristocrats', and the tours, consequently, were quite quiet. By the end of them, though, I had learnt far more about 18th century dresses than I ever thought possible. On the subject of tours, and the travails of guides, Alan, who has been guiding at Tredegar House since 1999 (and before that, at Haddon Hall in Derbyshire) swears blind that a couple of weeks ago, a visitor to the House asked him, in all sincerity, why the Morgans built their ancestral home so close to the motorway!